Are you into the trend? Lilli è bellissima questa selezione! Mi piacciono tutte e quattro le camicie, perfette per queste periodo. Sono deliziose queste camicine, una più bella dell'altra! I don't usually follow trends but this is one that I would love! The pink blouse is my favourite. Ruffled long sleeves blouse is perfect transition for Fall. It's warmer to wear and looks chic. Le camicie sono proprio belle! 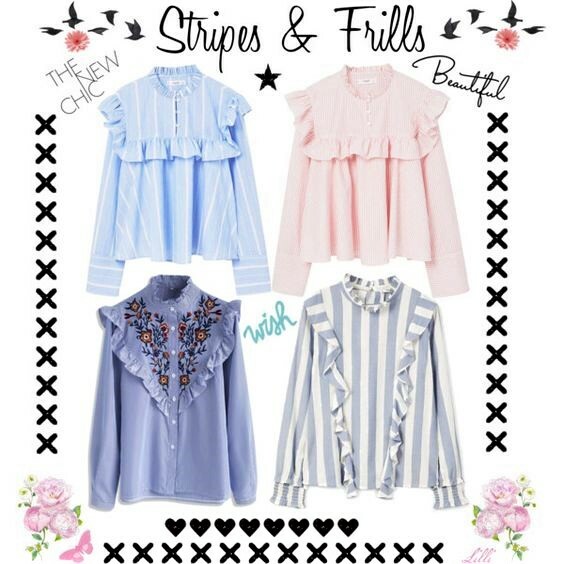 Ah i like these ruffled Blouse trend. These shirts are so pretty nice femine. And with a cardigan ew can wear such a blouse at winter to. Thank you for inspiring dear Lilli. I love them all, but my favorites are the blouses with the stripes.